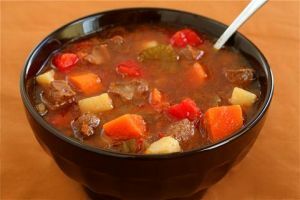 Beef and Brew Soup is a recipe for the crock pot for beef and beer soup with vegetables. In a 5 or 6 quart crock pot, place onions, carrots, parsnips, garlic, bay leaves, dried thyme, and pepper. Add beef broth and beer. To serve, remove bay leaves; if using fresh thyme, stir in now.